Since there are few surviving historical documents, historians have their theories about the origin of karate. Some historians believe that karate originated in China, while others believe that karate originated in Okinawa during the 15th century CE [“History”]. However, there is compelling evidence that karate originated in Crete and that it was brought to Okinawa in the very distant past. This article endeavors to establish that boxing and karate descended from a sport that is thought to have originated in Crete. Pax Minoica was coined by Sir Arthur Evans to describe his theory that, for lack of contrary evidence, the Minoans belonged to a peaceful society [“Minoan”]. Disregarding the ensuing controversy, it is evident that the Minoans enjoyed sport. It has been said that, as early as 2000 BCE, both boxing and wrestling were popular among the Minoans. The Greeks combined these sports in παγκράτιον (pankration) “a complete contest” [from πάν (pan) “all” + κρατέω (krateo) “to be powerful, to be strong; to conquer, to get the upper hand”]. Cf. 空手 karate, an “empty-handed” martial art. Moreover, κρατέω (alt. κρετέω) may be found in the Arcado-Cypriot (Linear C) transcriptions as *ke-re-te-o. Plato refers to the practice of σκιᾶ-μάχεω (skia-makheo) “shadow fighting” [from Greek σκιᾶ (skia) “shadow” + μάχεω (makheo) “to fight”]. The modern pronunciation is skiomachy [“Traditional”]. Shadowfighting occurred in the shade of either a school or a staging area, such as a ring [L&S 733]. I distinguish shadowfighting from shadowboxing, which appears to be a reanalysis of a practice in which the student “boxes with his own shadow”. Minoan fresco from the 17th century BCE. Okinawan karate from the 20th century CE. One karate instructor characterizes, as follows, the movements in both the fresco and the photo: When the first person throws a rising punch, the second person counters with an inside rising punch, thus throwing off the first person’s movement and connecting first. Legend states that, as early as the fifth century CE, karate was developed in China with the transmission of Zen Buddhism. However, some historians believe that karate originated in Okinawa during the 15th century CE [“History”]. Nevertheless, until the annexation of the Ryukyu Kingdom to Japan, karate instruction remained secret for many centuries, due to the ratio of one master to one student within Japan’s warrior class [“History 6”]. Okinawan karate maintains both shadowfighting and shadowboxing. In addition to exhibition fighting, makhia lives in the unarmed, boxing style of machimura suidi, which is the archaic name for the modern art of shinseido and which encompasses shadowboxing practice [“Shinseido”]. The pronunciation of /ch/ in the Japanese machi- is identical to the /ch/ in match. Compare the Greek μά̆χη makhê “battle, combat” and the Okinawan maki, which means defeat or loss. Compare, also, IE magh- and the related term, match, which, in this context, means contest. (See also Japanese Concordances with Indo-European (IE) Languages: MAKI.) Further, compare mura, which has two apparently related meanings — (1) 村 “village” and (2) 群 “gathering” or “group” — with Greek μόρα mora “(military) division”. Suidi is an Okinawan word for shuri-te, which comprises Shuri and te. Shuri refers to the former capital of Ryukyu Kingdom, before it was annexed to the country of Japan. Now, Shuri is a district within the Okinawan capital of Naha [“Shuri”]. Te (手) is said to mean hand. Karate (空手) also includes te and has been interpreted as “empty handed“, which refers to self defense without a weapon. While te is similar in both pronunciation and morphology to AB 004, evidence suggests a different interpretation for this sign. The History of Karate. Hands of Life Martial Arts.com. Ret. on 31 Aug 2011. The History of Karate 1: Appearance and Its Origin. Okinawa BBTV.com. Ret. on 31 Aug 2011. The History of Karate 6: Spread to outside of Okinawa. Okinawa BBTV.com. Ret. on 31 Aug 2011. Minoan Civilization. Citizendia.org. Ret. on 31 Aug 2011. Shinseido Shorin Ryu. Shinseido: Practical Karate For Self Defense. Ret. on 31 Aug 2011. 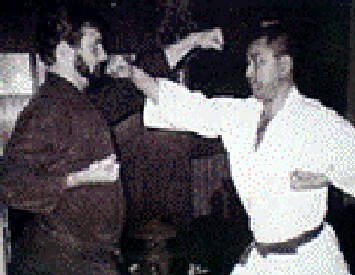 <headingleykarate.org>. Shuri, Okinawa. Wikipedia.org. Ret. 23 Sep 2011. Traditional Martial-Arts Training: Pankration. Black Belt: World’s Leading Martial Arts Resource. 2010. Ret. on 1 Sep 2011. <blackbeltmag.com>.